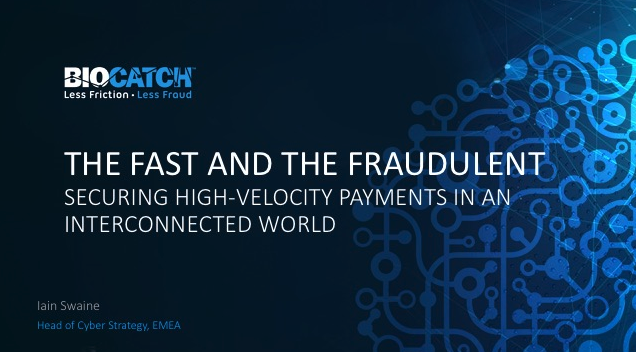 BioCatch delivers efficiency and bottom line results in a faster payments, P2P world, where user convenience is key and fraudsters take advantage of vulnerabilities in the ecosystem. Faster payment schemes and P2P payment platforms are subject to unique challenges around digital onboarding, strong authentication and vulnerabilities on the mobile and web related to money mules and other types of cybercrime. The user experience, however, is paramount to continued growth and adoption as abandonment rates in account creation and at the time of transaction cost much more than actual fraud. 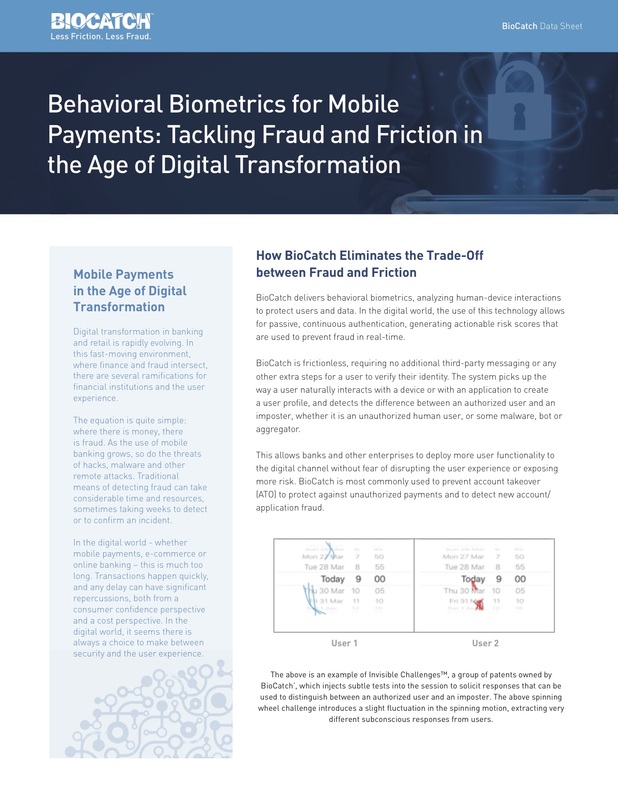 BioCatch closes the gap, preventing fraudsters from using stolen or synthetic identities in creating new accounts or applying for credit cards, and then quickly and seamlessly validating user identity for a transaction, limiting unnecessary friction and step-ups. Implemented by top tier financial institutions across the globe, our technology delivers efficiency and bottom line results. Proven ROI. Deployments with tier one financial institutions around the world cover 90 million users with 10-15x return on investment. Commitment to continued innovation. Our broad patent portfolio - more than 60 patents granted or pending - drives differentiation and technological leadership in dealing with today’s changing digital identity landscape. Support for the entire digital identity lifecycle. 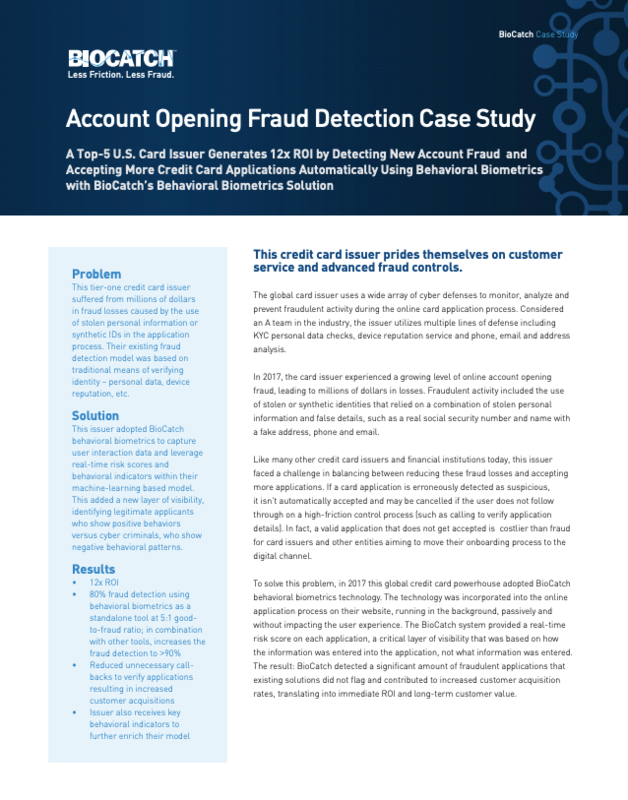 BioCatch’s 2000+ behavioral profiling metrics generates powerful insights that can be applied to identity proofing, continuous authentication, preventing account takeover fraud and more. We provide identity verification for legitimate users and detect a full range of human as well as non-human (RAT, malware, aggregator, robotic activity) cybersecurity threats to keep ahead of the fraudsters and change the rules of the game. Prevent the use of stolen or synthetic identities in the online account opening or credit card application process through the use of advanced capabilities, like understanding navigational fluency, application fluency and data familiarity, even when no user profile exists. Efficiently and transparently authenticate legitimate users based on a dynamic behavioral profile, injecting Invisible Challenges to ensure the integrity of a payment. Detect social engineering, bot activity, targeted malware, spoofing, and other fraudulent behaviors before the damage is done by modeling different types of genuine and malicious behavior and enabling real-time action.